ASHEVILLE, North Carolina, August 1, 2012. As Asheville’s newest contemporary fine art gallery, Artetude Gallery, Inc. is pleased to announce a new and innovative program, “Contemporary Art on a Mission”, with the Mission Health Foundation in which Artetude Gallery, Inc. pledges a portion of retail art sales to support the cancer programs at Mission Hospital. “We are excited to bring to Asheville and Western North Carolina compelling cutting edge sculpture, painting, monoprints and photography from nationally and internationally recognized artists, and we are proud to partner with Mission Healthcare Foundation as an important part of our commitment to support the cultural, social and physical health of our new home community” said Margaret K. Offermann, MD, PhD, President of Artetude Gallery. Dr. Offermann, a medical oncologist, was the founding past Medical Director of the recently opened SECU Cancer Center at Mission Hospital. “Given Mission Health’s commitment to providing both a state-of-the-art facility in the new SECU Cancer Center, but also enhancing the level of services available to all the residents of Western North Carolina, having the support of fine community businesses like Artetude Gallery is critical to both reducing cancer and increasing the survival rates in our region,” said Bruce Thorsen, President and CEO of Mission Foundation. “Our trustees are committed to helping cancer patients receive the very latest technology and treatments right here near home, and that is going to take generous gifts and grants to bring high caliber research and researchers to Asheville to work at the SECU Cancer Center. 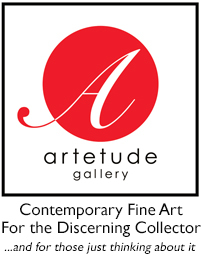 We are delighted with our partnership with Artetude Gallery and hope others will follow their lead,” Thorsen concluded. “We are proud to work with Mission Healthcare Foundation through ‘Contemporary Art on a Mission’ to realize our goal of building a dynamic and sustainable business model through which contemporary art collecting contributes on a continuing philanthropic basis to the community”, said Russell Medford MD, PhD, Chairman of Artetude Gallery, Inc. Dr. Medford is President and CEO of Salutria Pharmaceuticals, Inc., a biotechnology company developing new drugs for the treatment of heart disease, based in Atlanta, Georgia. “I am pleased to be a part of this new endeavor between the business and philanthropic communities,” stated Perry Magee, Director of Artetude Gallery. “We believe this initiative is a natural expression of the commitment to community that all of us at the gallery feel. It also complements well our corporate commitments to support and grow the careers of our artists, to create new contemporary art collectors and to exceed the needs and expectations of established collectors”. Mr. Magee brings extensive experience in the business of art through senior positions at contemporary fine art galleries in New Orleans, LA and Carmel, California. Founded 1 June 2012 by two physician-scientists with a love for contemporary art and deep respect for the symbiosis between collector and artist, Artetude Gallery, Inc. is Asheville’s newest contemporary fine art gallery featuring compelling, cutting edge sculpture, painting and photography from nationally and internationally recognized artists. With each piece of art, Artetude Gallery is committed to developing long-term term relationships with both new and established art collectors to help them realize their vision in building the finest and most meaningful contemporary art collections for their home and office. The Gallery’s “Contemporary Art on a Mission” program with Mission Healthcare Foundation reflects the philosophy of its owners and employees by building a dynamic and sustainable business model through which contemporary art collecting contributes on a continuing, philanthropic basis to the cultural and physical health of our Asheville and western North Carolina communities. Margaret K. Offermann, MD, PhD, President of Artetude Gallery, Inc. is former Deputy National Vice-President of Research for the American Cancer Society and former Professor of Medicine and Associate Director of the Winship Cancer Institute at Emory University School of Medicine in Atlanta, Georgia. She is currently president-elect of the Federation of American Societies for Experimental Biology, located in metropolitan Washington, DC. Russell M. Medford MD, PhD, Chairman of Artetude Gallery Inc. is former Chairman of Georgia BIO, currently on the Board of Directors of BIO (Biotechnology Industry Organization) based in Washington, DC, on the Board of Advisors, Institute for Bioscience and Bioengineering, Georgia Institute of Technology, and on the Board of Directors, National Health Museum. Mission Foundation is a 27-year-old not-for-profit public charity that supports the services and programs of Mission Hospital and Mission Health. The Foundation trustees and staff seek contributions and grants from individuals, corporate, civic and governmental sources to provide financial stability and underwriting for a wide variety of programs and projects that serve thousands of people in Western North Carolina. Those programs include: Mission Children’s Hospital; The Ladies Night Out Mammography program; the MAMA helicopters, genetic counseling services; nursing and allied health education; The SECU Cancer Center; Mission’s Stroke Program , Mission’s Heart Center and the Toothbuses, mobile dental offices giving free or low cost dental care to grade school children in the region. The Foundation is governed by a 29-member board of Trustees and is based in Asheville. For more information, visit us at Artetude Gallery, 89 Paxton Avenue, Asheville, North Carolina, 28801, our website at www.artetudegallery.com or contact Perry Magee, Gallery Director, Artetude Gallery, Inc., pmagee@artetudegallery.com, 828-2521466.